Victor Granja from Nicaragua is in Liancourt since June 3 and has begun the education of six youths. With construction of the Workshop they will learn some basics of masonry as well as how to produce various construction materials. Later additional apprentices will be absorbed and work groups formed for production and construction. Victor, a young engineer from Nicaragua with experience in development and production, is backed up by an experienced mason as well as a „handyman“ who also serves as a translator from Spanish to Creole. The terrible earthquake in Haiti again demonstrates the direct relation that exists between poverty and disaster. It is the permanent catastrophe of poverty that causes the disaster when a hurricane or earthquake hits. The bad condition of buildings, whether from age, from having been badly constructed, or from lack of maintenance, combines with the lack of a civil defense organization to provoke complete chaos. Past edititions of the e-Magazine have analyzed reconstruction projects in Peru, the Dominican Republic, Nicaragua and Honduras. We have also reported about the new line of work of the EcoSur Network that combines reconstruction with prevention and mitigation from the next sinister event that undoubtedly will arrive. 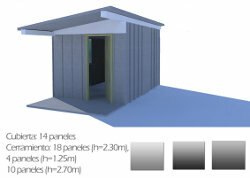 This idea to rapidly build a small refuge to ensure that damage victims can count upon a safe place, albeit only one room, is an old idea and has been discussed many times. What has always been lacking is the decision of an organization to have such refuges ready for immediatge despatch. Sofonias Nicaragua has developed this idea and has in its yard a modest cuantity of elements for rapid assembly as well as two production equipments ready to send to anywhere in the country to respond to an emergy. CIDEM in Cuba has embraced this idea and is putting it into practice. Plan “Mambi” contemplates a secure nucleo, whereby the family can afterwards build the rest of the house through its own resources. At a future time, when the damages of the 2008 hurricanes have been resolved, it wishes to produce elements and store them in the municipal yards, and in this manner be able to respond in few days to any emergy. 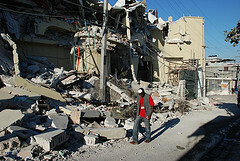 Grupo Sofonias is in contact with various organizations that are collecting to aid Haiti. Nevertheless, we fear that because of the general chaos and the lack of a competent organization in the country it will not be possible to begin a reconstruction project before several months... meanwhile we are coordinating among various partners of the EcoSouth Network to respond when possible.